The power of a compelling narrative has always been an easy draw for me, particularly in the travel narratives of others. Wanderlust piques my interest, but the story captures my attention, and I’m not alone. Narratives and storytelling are fundamental to human experience. Doris Lessing writes, “A story is how we construct our experiences,” and as products of an increasingly digital world, this sense of construction is nowhere more tangible than in our engagement with social media. Each time we post, tweet, or snap to impart information to others, we also contribute to and shape the narratives of our lives. In turn, our followers interpret, engage with, and respond to what we’ve shared. As an information student, I am especially focused on the information habits of others: how do other people interpret information, and, consequently, which methods are best to reach the widest audience? This past summer, I wanted to share my own travel stories easily and instantaneously with family and friends. Before and during my travels, I wondered how best to translate these experiences for others beyond a photo album or the occasional post of media on Facebook. So I investigated and considered the storytelling capabilities of three social media apps: Instagram, Vine, and Snapchat. Instagram‘s optional filters and simple editing tools enable users to design a cohesive and aesthetically pleasing narrative. Its accessible interface fuels creativity in its users, and interesting angles, unusual subjects, and attention to details are all hallmarks of Instagram’s most attention-grabbing photos and videos. Videos may last from 3 to 15 seconds, providing for a momentary glimpse into the user’s experiences. I also found the add a location feature helpful to connect with other users, who also linked their posts to my location. In this way, our media becomes a collaborative effort in sharing our diverse perceptions of the landmarks we encountered. Twitter’s Vine is the app I used least during my travels. Vine videos last approximately 6.5 seconds long and usually require some preparation beforehand, which is not often an option for the on-the-go traveler. However, this length is ideal for followers, who can review posts with ease while scrolling through their feed. Vine also offers little in terms of editing, but the initial planning required before recording combined with the time constraint, challenges Vine users to be innovative in their design. The products are often highly addictive and hilarious, and because they are experienced at lightning speed, it is much too easy to get lost in the Vine vortex. I had initial reservations about Snapchat. Mostly because many of my friends use it almost exclusively to exchange hilarious selfies. I mean, have you seen the rainbow mouth feature?! Yet, I soon realized that posts on Snapchat or snaps introduce a temporal element in a way that Instagram and Vine posts do not. 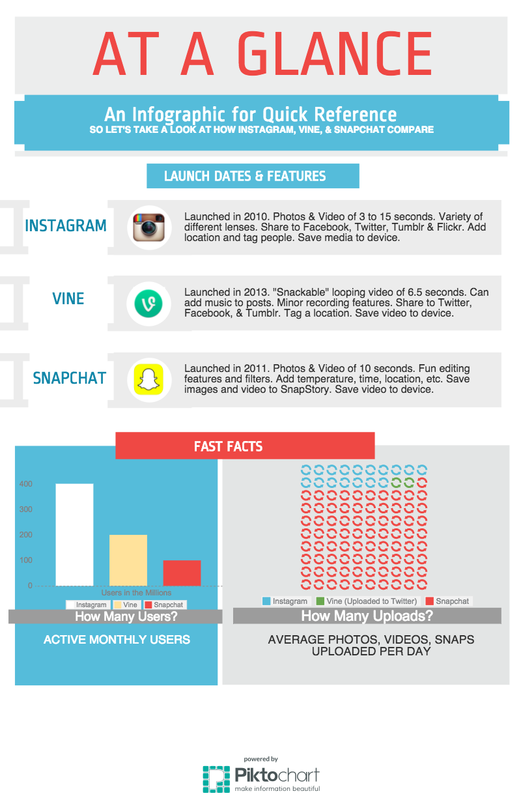 Videos sent directly to followers may last 10 seconds at the most, and once viewed, they disappear. Users may also post their snaps continuously over the course of 24 hours to be compiled in the “my story” feature. These, too, will disappear after a 24 hour period. This ephemeral in-the-moment quality demands that your viewers follow your stories closely and nearly contemporaneously. But fear not! Users may save their snaps to their device for later viewing. Snapchat’s editing features are less extensive than those of Instagram, but in some ways, the shakiness of the camera and the background noise provide for a more authentic narrative. What do you think? How do you share your stories?